Back in college, I put forth a theory to my friends that the whatever version of a classical or theater work you encounter first will be your canonical version. This theory arose during a discussion about which version of the Evita soundtrack each of us preferred. One camp chose the concept album recorded before the show was staged in London. I opted for the Premiere American Recording with Patti LuPone in the title role. So I posed the question: which did you hear first? Sure enough, my friends heard the London recording before the American recording, and it was the reverse case for me. It’s not a theory I’ve put to rigorous study, but there’s an intuitive logic to it. Classical music requires a lot of work to internalize, and when I’m listening to a particular work for the first time, that recording becomes my source. I’ll have listened to it numerous times, absorbing not only the workings of the piece but also the idiosyncrasies of the recording — the sound of the hall, the articulation of the players, the tempo and expressive choices of the conductor. If I’ve lived with one recording for long enough, another recording of the same piece needs to go through that same process of internalization. And that first listen of a new version is where the discomfort sets in. The sound of the orchestra lacks a certain resonance. A particularly movement was taken too slow or too fast. A particular section gets muted while another gets overemphasized. I learned this lesson with Sergei Prokofiev’s Symphony No. 1 and Lieutenant Kije Suite. 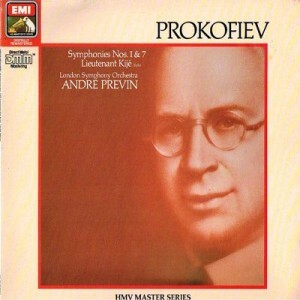 Back in 1988, I bought a cassette of André Previn conducting the London Symphony Orchestra. Symphony No. 1 and Kije took up side one. Symphony No. 7 took up side two. I got rid of the cassette in 2002, and I thought I could replace it with any old budget recording of the same works. So I picked up one by Eugene Ormandy and the Philadelphia Orchestra. The nuances of Previn and the London Symphony had soaked so far into my subconscious that another interpretation just wouldn’t suffice. I let the Ormandy recording go and didn’t seek another one till I found a vinyl version of the Previn recording in 2013. That sent me on a hunt for a CD version. I was disappointed to learn it was reissued in the United Kingdom but not in the United States. A number of Google searches later eventually led me to a used copy of its original reissue on CD in the States in 1986. Hearing that specific recording transported me back to high school, when I would listen to that tape on bus rides back home. This preference for the first-encountered recording probably explains listeners’ aversions to live recordings and covers. Could Sam Smith really live up to the distinct quiver of Tracy Chapman’s voice on “Fast Car”? And just how does one replicate the gorgeous choir of Simon Le Bons on “New Religion” in a live setting? My collection now has numerous recordings of pieces, and I’ve learned to appreciate “non-canonical” versions on their own terms. In some rare instances, I may even prefer an alternate version. But that first time, that first encounter — it’s home, and there’s no place like it.